The result was the Société Générale de l’Horlogerie Suisse SA, created on August 14th 1931, better known under the name Allgemeine Schweizerische Uhrenindustrie AG or ASUAG. Its first president was Hermann Obrecht. The first thing ASUAG had to do was secure the finances, for such an undertaking as consolidating all of the various companies was going to require an awful lot of money. And even scraping the bottom of ASUAG and banks' financial barrels there was still not enough. Analysts allowed themselves the luxury of being precise – they were short of 13.5 million Swiss francs. At this point they activated number three on their action list and knocked on the door of the Swiss government. It is not common for the State to come to the financial aid of a private company, but the situation was unusual. Firstly there was the enormous number of unemployed watchmakers, and secondly watchmaking in Switzerland is not looked on as any old industry, but rather as a national treasure that carries its image and values throughout the world, reflecting far more than simply figures on an export balance sheet. On September 11th in 1931, after lengthy negotiations, the Swiss government sank 6 million Swiss francs into ASUAG, at the same time granting them an interest-free loan of 7.5 million Swiss francs, repayable at the rate of 1 million Swiss francs a year, starting in 1934. ASUAG now had a clear field and the consolidation of movement blank manufacturing and the regulating of sales was conducted swiftly. By 1932 Les Fabriques d’Assortiments Réunis SA and Les Fabriques de Balanciers Réunis were created. The same year Ebauches SA acquired Manzoni, Moser, Peseux, Fleurier, Ed Kummer SA (Atlantic watches) and A. Reymond SA and Eterna, two makers who made both movement blanks and complete watches. These latter are worth a closer look. 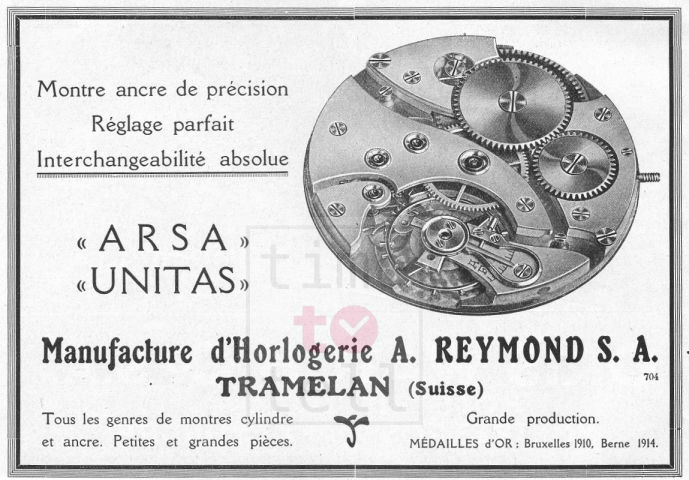 Auguste Reymond created his Fabrique d’Horlogerie in Tramelan in 1898. The company grew quickly and became a ‘Manufacture' in 1906 by producing its own calibers, first in Les Bioux, then in Tramelan. In 1918 the company became a limited company under the name A. Reymond SA or ARSA and in 1926 bought the Unitas Watch Co. factory in Tramelan. At the time of the merger with Ebauches SA in 1932, the company was divided into two: ARSA for the watches, Unitas for the movement blanks. It was the same for Eterna. Joseph Girard and Urs Schild had joined forces in 1856 to manage a factory in Grenchen making movement blanks. In 1870 the company employed more than 300 people and the brand name Eterna was used from 1876. On the death of Urs Schild, Max Schild took over and it became Schild Frères et Cie. in 1891. In 1929 it produced more than 2 million parts and employed more than 800 people. By the time of their merger with Ebauches SA in 1932, the name Eterna was reserved for watches and the making of movement blanks became ETA SA. Despite these efforts, in 1933 there were still 22 ‘dissident' companies, including nine makers of movement blanks. It was time for the government to step in. 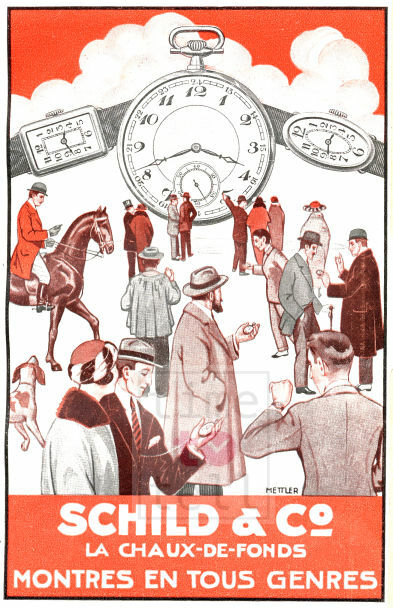 On March 15th 1934, it passed the Decrees of the Federal Council designed to protect the Swiss watch industry. From then on it was forbidden to start any new watchmaking company without a licence and to export 'chablons' outside the existing agreements. The Swiss watch industry was now under control. The buyouts continued but at a slower pace. The economic situation improved and demand took off again. All the same there were the takeovers of Champagne in 1938, Derby, Precimax and Gigantic in 1941, Glycine in 1942 and Valjoux in 1944. The fabled Valjoux SA, to which the Swiss chronograph owes so much, was called Reymond Frères at the time of its founding by John and Charles Reymond, in 1901 in Les Bioux in the Joux Valley. Hence, the initial R found on the movements. From the start the company specialized in chronograph mechanisms and made its own movement blanks from 1910. In 1929 John Reymond's sons Marius and Arnold took over and the business became Valjoux SA. In the single year of 1942 it produced no fewer than 60,000 movement blanks before coming under Ebauches SA's control in 1944.